This amazing dish seems quite simple, however anyone who tries it will forever fall in love with this refined taste. 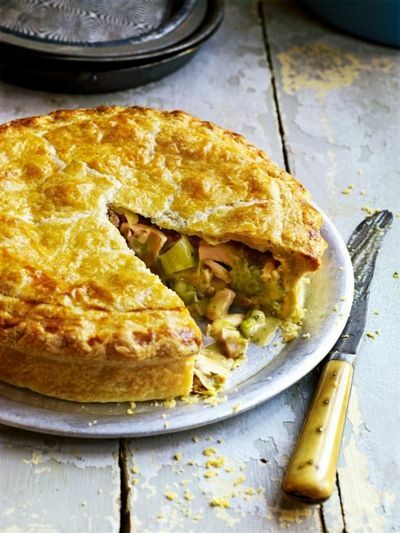 An open pie with leek is sometimes referred to as German cuisine, but the French like it most of all know how to make skilfully baked pastries. A surprisingly simple combination of cheese and onions in the frame of the dough and milk sauce gives rise to a truly brilliant taste. 1. Pour the flour into a small bowl, add salt and chopped butter. Mass the hands to homogeneity, so that there are no lumps left in it. 2. Add 7-8 tablespoons of water to the oil mass, mix and roll out a thin layer on the flour-dyed surface. 3. Place the dough in a baking dish. Press the dough to the bottom and edges, cut off excess edges. 4. Melt the butter in a frying pan and saute the leeks on it for about 5 minutes. The onion should become soft, and a little darker. In a bowl, mix it with cheese, cut into cubes. Then shift the cheese-onion filling onto the dough. 5. Beat eggs with milk. Add salt and pepper. Pour the cake and put in the oven, heated to 200 degrees. Bake for 35 minutes until a crispy appearance. 0 Response to "Recipe for the day: open pie with leek and cheese"